There are various Schmizza’s located throughout the Portland Metro area, each one delivering its own personal flair. Schmizza Pub and Grub located on the campus of Portland State University is a special location because of its proximity to Portland State and downtown Portland. Many of you are probably wondering why I would review this Northwest tradition, as it is widely known as a pillar of the pizza community. It is highly regarded for its variety of pizza ingredients and for its beer selection. However, this location, as well as the many other Schmizzas, has much more to offer than just pizza and beer. Schmizza Pub and Grub is perfectly situated on the campus of PSU as well as being a stone’s throw from bustling downtown Portland. This location makes for the perfect mix of college atmosphere and Portland nightlife which is hard to come by in a normal setting. Atmosphere isn’t the only reason to visit this quaint spot. If you haven’t been to a Schmizza in a while, you might not know that they are a fully stocked cocktail bar and the menu is full of delicious choices besides pizza, including wings, burgers, and pasta. Schmizza Pub and Grub offers a full menu in a college context while being near all of your downtown destinations. This location is not spacious, which appeals to the patron looking for the personal touch of a small bar, yet there isn’t a bad seat in the place for whatever sporting event you might be watching. 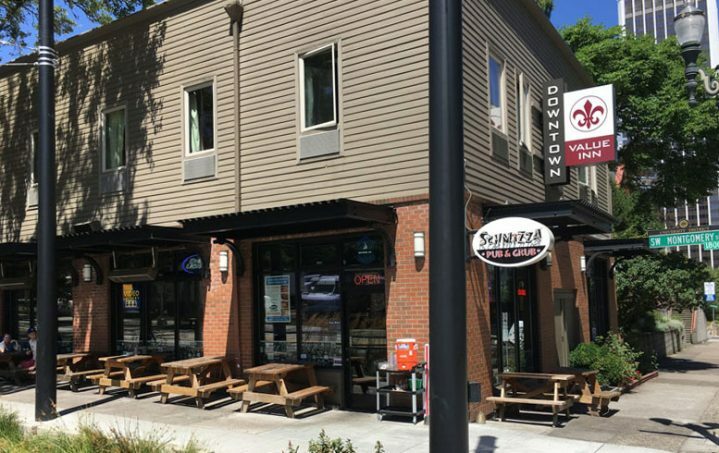 During the warmer times of the year, Schmizza Pub and Grub has ample outdoor seating along the Portland Streetcar line, making it the ideal spot to reach by transit. Schmizza Pub and Grub’s menu variety mixed with its cooperative staff make for a perfect place for an alternative to the basic “chain” sports bar experience. I highly recommend this sports bar the next time you and your friends are looking for college atmosphere combined with personal service as well as easy access to downtown Portland’s charm.